I remember seeing a discussion on Facebook a while back about why there do not seem to be any good horror novel written by Indian authors. My instinctive reaction to that – though I refrained from actually posting it on FB so as not to sound too provocative – was that the reality of being an Indian author is so horrifying that writing horror is rather difficult for them. 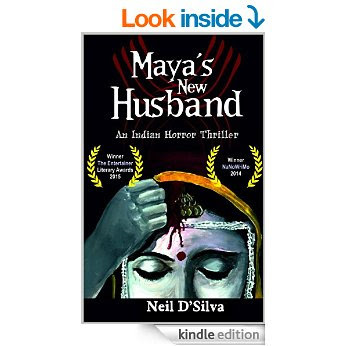 So I’m glad that Neil D’Silva seems to have reached a rather less-horrifying place in his life, because ‘Maya’s New Husband’ is unabashedly a horror novel by an Indian author. Tracing a brief and tumultuous period in the life of the titular character, Maya Bhargav, the book explores the depraved behaviour that might just, all-too-believably, be lurking behind the façade of urban respectability. It’s an action-oriented book, and the character-development focuses on Maya and Bhaskar Sadachari, the two prime movers in this tale. Others include Maya’s sister, Namrata, her mother Anuradha and best friend Padma. 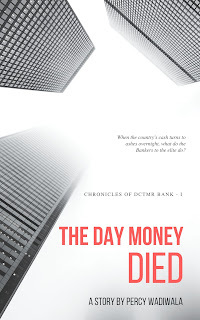 The plot is fast-paced, Mr. D’Silva’s prose is lucid and simple without pandering to the uneducated masses, and he understands how to use language. I particularly appreciated how the themes of smell and taste are used to convey emotions - fear and lust. His writing is very visual, and shows an eye for detail and realism that is worth emulating. The writer concentrates on the gruesome aspects of the story, bringing to life the ritual cannibalism of the aghori sect, intersecting it with the manic schizophrenia of the main character in a way that’s truly chilling. In a book like this, where plot is central to the appeal, putting up too much more would be spoiler-y, so I’ll just say that even if there aren’t enough twists, there’s a lot of fun to be had in enjoying this book for the pictures Mr. D’Silva paints, the realism of the situations and the way it all seems like this could really happen. There are very few negatives here (assuming you are not looking for this to be Tolstoy). Certain aspects of the story may seem difficult to believe, such as Maya’s rushing into a marriage, her inability to see the red flags in her husband’s behaviour, but in my experience, they are all-too-real. Fact tends to be stranger than fiction, and Maya’s New Husband in that sense at least, is no fantasy. Some may cavil at the use of some stereotypes in the non-main characters, but that’s not an objection I hold stock with anyway. There’s also a few editing / typographical errors which will probably be weeded out before the second edition is out, but nothing worth mentioning. All in all, Maya’s New Husband is more than a promising debut (because it is, in fact, Mr. D’Silva’s first novel), it’s hopefully a taste of better things to come. Disclaimer: I have interacted with the author online, though very rarely. I have paid full price for the book, and had not been requested to give a review at all, let along a favourable one. Nice! This is what I call a review. Only an avid reader and connoisseur of everything pertaining to writing can come up with such a review. It is obvious you know the author, Percy, but the dispassionate way with which you have analyzed the merits and demerits of the book is remarkable. My congratulations, Neil, for writing such a book and to you Percy for coming up with such a review. Thanks.